Last week Simon Wilson lamented about the mess that has happened in relation to Albert Street’s reinstatement as part of the City Rail Link project, something we’ve long been concerned about. This built on the City Centre Advisory Board‘s (CCAB) deep disappointment with the designs for the street, especially the lack of greenery and the inclusion of unnecessary lengthy bus bays along large stretches of the road. …Albert St’s new footpaths will be wider, but despite that it’s a bleak, featureless landscape. Right by the Wellesley St and Victoria St entrances to the CRL’s new Aotea Station, where tens of thousands of people will walk to and fro each day. The street was almost destroyed by the CRL build. But the thing is, with most of the traffic gone, new possibilities now beckon. We’ve discovered the city functions just fine without Albert St being an ugly dead zone, so why turn it back into one? The strategy for making good in the inner city in the wake of CRL construction (and light rail too) should be: use the disruption to establish new and better functions and features. Less transit route and more pedestrian-focused, more shopper focused. Better streets to be in. Viv Beck repeated the bit about being deeply disappointed. She still wanted to scream and throw things. This generates around $20 million each year – and these funds are used to upgrade and develop the city centre with projects like the shared space programme and public space upgrades like St Patrick’s Square and Freyberg Place. These projects bring to life the City Centre Masterplan – which recognises the role that the city centre plays as the economic engine for Auckland and the whole of New Zealand. In order for the city centre to remain vibrant and successful and to accommodate the anticipated growth, ongoing investment into the public spaces and transport infrastructure is needed. The investment seeks to significantly enhance the city’s public spaces to make them more people friendly as well as encourage further private sector investment. As a comparison, here’s what this section of Albert St looked like before the CRL works started. There were even more trees then. What’s proposed is even noticeably different from the concept design which I think was used to help get the CCAB to approve the use of the targeted rate funding. This is the same section and while some artistic licence has been taken with the scale of the trees, it clearly shows them in place of the bus bays. The lack of trees in particular is noticeable in other parts too. For example the section just north of Victoria goes from having at least some green. To being almost completely barren. This is also where, brick by brick, they’re going to shift the historic bluestone wall to gain some extra space. I might not mind so much if it meant we got an exit on the northern side of Victoria St, the lack of which I think is a serious omission. Related, does anyone know what are those triangular things in the middle of the footpath are for? station ventilation? 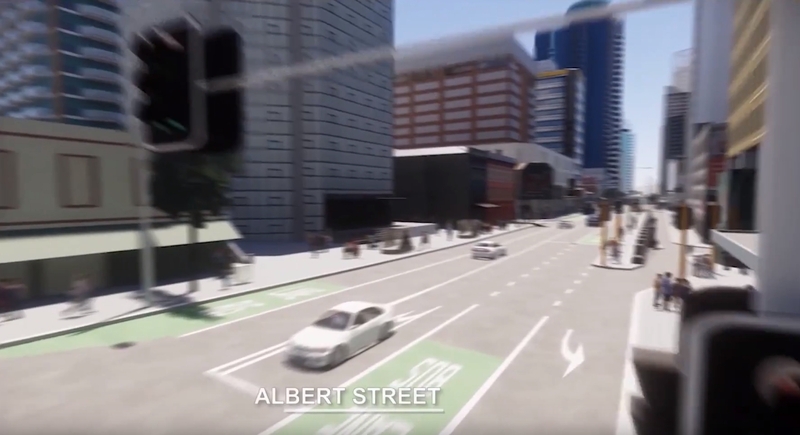 My guess: Albert St was visualised by traffic engineers who don’t listen to a word urban planners say; but Wellesley St is merely a concept right now, so it was visualised by designers who have not yet been crushed underfoot by engineers. We don’t hold back in our critiques of transport engineers, but in this case I think the issue is more one of silos and various parts of Auckland Transport not keeping up with big picture strategic transport changes that have taken place over the past year. In particular, Albert Street was to be the city end of the Northwest Busway before the new government adopted our suggestion from the Congestion Free Network that we should instead be looking at light-rail for this rapid transit corridor. Detailed analysis of city centre bus operations highlighted several issues with feeding large bus volumes into Albert Street in the future. Its capacity was assumed to be exceeded by 2026 and under very significant strain by the mid-2030s. This lead ATs bus operations teams to demand that Albert St was able to accommodate more than 70 buses an hour on Albert Street to maximise their chances of maintaining an efficient busway at its city end. It’s not clear why the bus stops the bays are for are even there. It’s worth remembering it’s been a few years since we last had buses on Albert St North of Victoria and it will likely stay that way till around 2023/24 when the CRL is completed. The focus should be on having people use stops near Britomart or Wellesley St and AT’s own design standards say they shouldn’t be used (page 43 of this doc). As I understand it, the way the CRL delivery has been set up, even when it was still under AT, they weren’t allowed to push back on the demands and so we’ve ended up with this compromised outcome. Note: I understand the need to accommodate these bus volumes has also been a factor in the in the delay to the improvement to Karangahape Rd project. In any case light-rail makes the whole issue irrelevant anyway. Unlike the Northwest Busway, a Northwest light-rail line would simply link into the City Centre to Mangere light-rail line somewhere near Upper Queen Street with both running down Queen St. This would remove a large chunk of the buses from Albert Street and while some buses would still need to run on it (those serving the inner west), the volumes will be vastly lower than if the whole Northwest Busway was plugging into Albert Street. For Queen St it would still be only a LR vehicle every few minutes leaving plenty of time for pedestrians to cross. Therefore there really isn’t a need for a 5 lane wide Albert Street anymore. 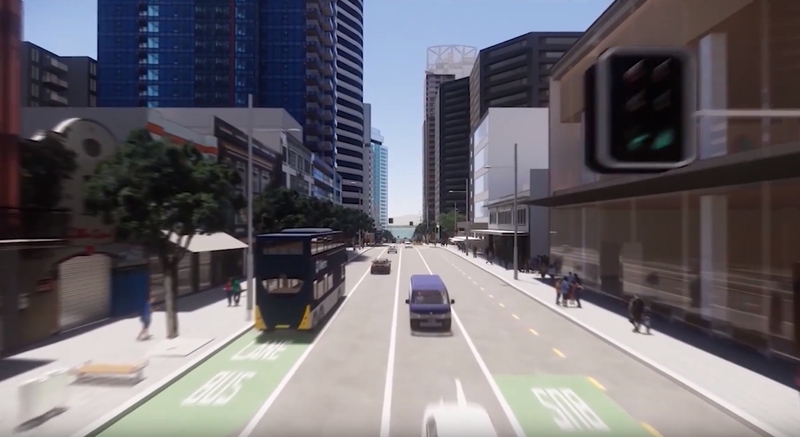 Auckland Transport needs to wake up and realise times have changed, the busway will not be happening and Albert Street does not need to be a vastly wide bus corridor anymore. The debacle is why they haven’t yet realised this. 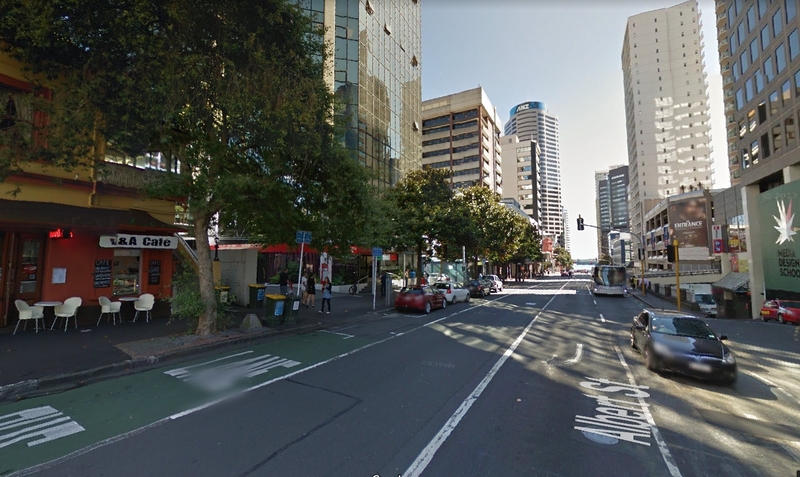 Pretty simple observation – why would anyone with an opportunity to re-design a street in Auckland to make it more pedestrian friendly not give it a full set of verandas? It rains quite a lot in Auckland. Apparently designers don’t like them and prefer everyone poke each other’s eyes out with umbrellas. I was so pissed off when they removed the covered walkway between Aotea Square and Wellesley St for aesthetic reasons. Everyone can just get wet. Well here is the thing about Auckland and verandas. Auckland is pretty sub tropical in summer, and lord knows this is only going to get more so with global warming. Wide footpaths mean diddly squat if it is raining, people will still hurry across the rain swept area. But warm, sub tropical rain on full, expansive verandas over wide footpaths mean outdoor seating and pedestrian movements are unaffected. This is more important, IMHO, than even trees. If I were a retailer, I’d be screaming for verandas above everything else. It means the difference between people lingering and hurrying by. Insanity! In Portland buildings in the city centre are required to have verandas that cover the footpath. When I moved here I assumed it would be the same because of the similar climate. Actually, it’s more needed here because the rain comes in inundations rather than a continuous mist like PDX. Only *some* (usually UK trained) designers don’t like them – most designers I work with understand that they are a vernacular architectural response to Auckland’s climatic conditions and fully support their inclusion on new buildings and their retention on refurbished buildings. Easy! Some (ex) UK designers love them! I recall a post on this site with a comment from Ludo Campbell-Reid who is the Design Champion and General Manager of the Auckland Design Office at Auckland Council. He stated that it was wetter in his native UK than Auckland. In this he is utterly wrong. A quick check of annual rainfall from London, Manchester, Edinburgh, Birmingham, Brisbane, Sydney and Wellington shows that Auckland has far more rainfall with the exception of Sydney. Clearly with design guidelines being developed by such blatantly inaccurate assumptions it is no wonder we have the shelterless solutions offered and built. It is also way overdue for design / architectural concept drawings and flybys to depict the streetscapes they are promoting in real life conditions rather than the rare perfect windless sunny day nonsense we are dished up with. I know this sounds silly – but the rain in NZ is different from the rain in the UK. Our rain drops are fatter or something, and the wind means that it goes sideways as well. In England it is smaller, more mist-like, but mostly straight down. We’re having a spot of stormy weather in Wellington at the moment, but if this was in the UK they’d be declaring a national emergency. Different weather. Re verandahs – i think it is just that traditionally, there is little history of verandahs in the UK – possibly connected to their use of masonry with little resistance against lateral forces (i.e. could a heavy verandah rip out of the side of a brick building?). Out of interest, why do you suppose that UK-trained designers dislike verandas? Is it simply that there is no tradition of building them in the UK? I recall comment that verandas prevented pedestrians having an unobstructed view of the fronts of buildings and so people couldn’t admire the architectural qualities of the buildings they were on. It was then followed by the, incorrect, statement that it rains more in Britain than Auckland as a further justification. Not quoted verbatim but this was from Ludo Campbell-Reid. I wonder if they were seen as an Americanism, and therefore avoided. Engineers will do their best to give you want you want. Often though the push to get on with what they have been given to do, lots in a small time frame. This means they often get underway before the entire scope including placemaking has been decided. Then the engineers may resist any further changes that have timing and cost implications. For their part the political leadership is often fractured and often puts placemaking objectives on the back burner once the project is underway because they can be contentious. I am sure the placemaking function would have done more had they had clear direction from Council to do so much earlier. I see this as a case of a lapse of effective Council oversight and leadership to determine and then convey, their requirements for Albert Street. They then had to ensure these requirements were designed in, and construction integrated with the entire project. The buildings may or may not have awnings, the animators would have no info about that, and would just be using what’s there now as place holders. But you raise an important point about the offline busbays, which obviously take out space for trees (essential, not just nice-to-haves), but also for shelters, and space for pedestrians to pass waiting bus users. It is very hard to see how five vehicle lanes can be justified on the new Albert St just from a pedestrian, train and bus users perspective, even if it were desirable from any other. I went for a walk up Albert St just last week, and yes, it is currently a bit of a war zone. A couple of things – firstly I can’t believe that anyone in their right mind would contemplate shifting the old bluestone wall (surely that is just going to end in tears) but secondly – the buildings! There’s a stretch of buildings in the middle that look as though they have been abandoned for some time and that the city has given up all hope of redemption. Anyone know what has been planned to take their place? I’m talking about the ones that run through to Federal St next to St Patrick’s church. Is this the site for one of Auckland’s monster tall new buildings? Hopefully not, but if so: having a mega tall building there will reap further havoc on this poor stretch of road. Thanks Adam, good to know the reason why. I’m just always a bit wary when old historic features (like the bluestone wall) are proposed to be dismantled and moved. Its reasonably often that this is the last is ever seen of them – or that when they are reinstated, they look as false as anything. Are you familiar with the old bluestone Brown’s Mill building that was near here? Demolished by the developer one day (around 1985-87?) and never seen again? The only way to build a better city is to build a better city. If we can’t get great streets when spending $3.4b to remove traffic when on earth can we? Albert St needs to be rebuilt once and properly, now. Ratepayers paid good money to Auckland Transport to bring together world-class research and establish a process to ensure our plans balance our objectives of place, movement, environment, liveability. It’s called the Roads and Streets Framework, and it was approved by the board in October 2017. The emerging financial implications of not having the RASF available when this project design started, and of it not being brought into the project when it was available, are clear to see: the CCMP, Sustainability Framework, Parks and Open Spaces Policy, Local Board Plans have been ignored, or at least insufficiently considered. The CCAB’s time is being wasted on having to agitate for a better design. Similarly, time will be wasted by Council staff, Councillors, Heart of the City, AT staff. If a better design is agreed to, money will then be wasted on more design work. If it’s not, we’ll have to waste money in a decade or so when we finally get the design redone. I wonder if the CCAB and Heart of the City could ask some questions about why the Roads and Streets Framework was obviously not brought on board for this important project. It could have saved a lot of money. We still need a north-south through street, and it looks like Albert Street is going to be it, because the only other street is Queen Street, and we are already lobbying here for that to be a pedestrian mall. And as for the bus stops, where else are they going to go, a revised Britomart bus terminal? And talking about buses, is there any plan for where they are going to park up outside peak hours. Saying that, I am sure the engineers and designers can do a lot better for Albert Street. 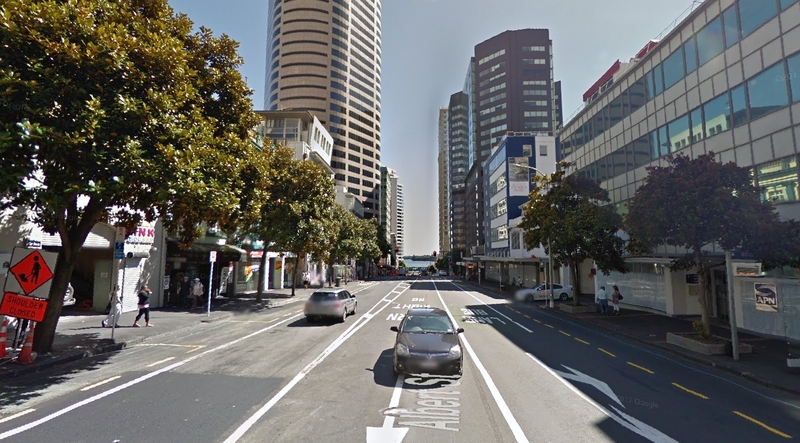 Do Hobson and Nelson Sts not meet the requirements for a north-south street for vehicle traffic? They do need taming, I know. Plenty of other streets, once claimed back from the car, will meet the requirements for north-south streets for the other modes. So it’s not just Mt Albert Village that’s been stuffed up…….. maybe there’s something in the name! There is a couple of six lane one way arterial roads one block over, that’s a total of twelve traffic lanes for the north-south through street. Albert Street only needs to provide for people, buses and traffic access to local properties only. There is zero need for it to take through traffic. The buses can stop in the lane, they’re all going to stop at each stop anyway so there is no point forcing them to pull into a bay only to pull out again. The can’t fit the slow and space hungry indented bus bays even if they were a good idea. Can you imagine how narrow it will get with a bus lane, then a bus stopping bay cut into the footpath, then a bus stop shelter occupying what little footpath is left? This is on top of the CRL station in the middle of town, there will be a lot more pedestrians walking along here. Yes after all it’s pretty much what general traffic has had/having with the CRL construction. If NW light rail joins to Queen St then even less reason for the indented bus bays. With all the other changes to connections to that road I think wouldn’t actually get much traffic, narrow the lanes, slower speed restrict turns, light phases etc would be no reason apart from local access to go down or up it. There are not, and never have been, a lot of retail outlets on Albert St apart from a few coffee shops. It’s hard to see why it should be made overly pedestrian-friendly. Bus bays are for one purpose only: to get buses out of general traffic lanes while stopped for passengers. Therefore it looks like Albert is going to become a major north-south route for cars, like Hobson and Nelson. Why do you think there historically hasn’t been retail and hospo on Albert Street? Possibly because its always resembled a motorway? When was the last time you pulled up a seat at the side of SH1 and had a Latte? How can you change things, if you won’t change things..sounds like a silly question but that’s exactly the case here. If your argument is that something has always been that way so why would we change it then we may as well do nothing anywhere? lol I think that is pretty much a boiler plate definition of how conservatives in Auckland think actually. Still does , we love it! Neil, this street is adjacent to the most densely populated area of New Zealand. It has the new main CRL station and crosses the Wellesley Bus corridor. Property developments along Albert St will surely follow the foot traffic money, and have much more people-friendly facades. If people avoid the street due to the lack of pedestrian amenity, or if property developments still present car-friendly facades that don’t attract people, that’ll be a triumph of car-centric design over people-friendly design. I think your point about the bus bays was more pointing out that their presence in the design indicates the priority given to general traffic at the expense of pedestrian amenity, rather than being there to support the bus network, and I agree with that. Heidi, you are correct. I merely pointed out that bus bays seem to indicate that the planners intend Albert St to be a motorway strip (for cars) like Hobson and Nelson. Joe jumped to a conclusion about an agenda that I’m not actually pursuing. Nevertheless, think for a minute why Albert St has never been a retail precinct. Firstly, it’s an uphill walk from Queen St – it takes a considerable effort to get there. Wyndham St, in the mid-section, is a particularly steep climb. Secondly, there are hundreds of Queen St business people who will not want any competition in parallel side streets. Queen St businesses don’t want any competition? Shocker…in that case better tear down Newmarket, all the malls, stop building Commercial Bay and bowl over High Street as heaven forbid we upset Queen Street business. You do know Auckland is growing right? You do know there are x3 HUGE apartments towers going up on Albert bringing possibly another 2000 people. Convention Centre and not to mention Aucklands soon to be busiest Train Station closer to Albert Street than Queen Street…but there’s a bit of an uphill walk from Queen Street!!!! What exactly are you trying to say here, what is your point? Breathe slowly and cool down. 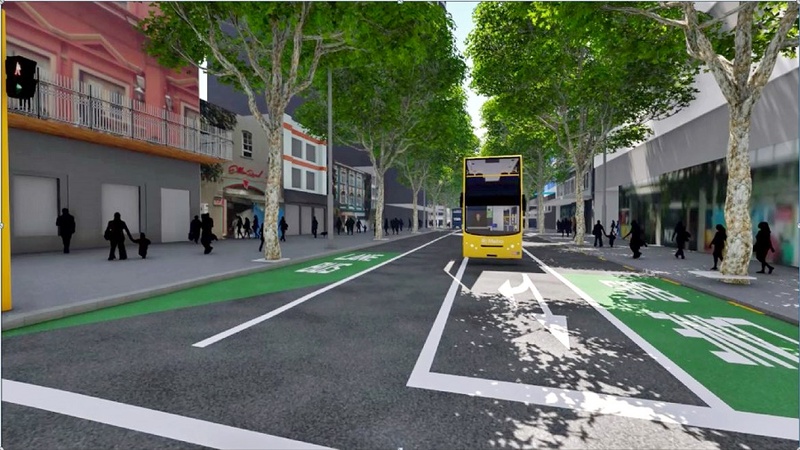 Why don’t you ask the planners why they show lots of bus bays in Albert St. The only justification would be to improve vehicle flow. They obviously have no intention of pedestrianising Albert St.
And everyone here is saying that their design is bonkers. Why are you defending it? A common situation I’ve seen is that the main street of a city is too expensive for useful retail – it’s mainly over-priced hospitality or consumer stores aimed at tourists and people with more money than sense. But the streets with lower rentals surrounding the main street are where more varied businesses, workshops and retail set up. Albert St’s location doesn’t worry me – I think people can cope with the hill from Queen St, since so many will arrive via Aotea Station. It’s current form is the sticking point – how quickly would that evolve into something more human-scale? Change can happen quickly – I was living in Dublin while Temple Bar was transformed. But the transformation from small and run down to funky and upbeat is probably easy than the transformation from too-large and sterile to human-scale and interactive. Do we have the right planning regulations to allow a swift, organic process of evolution on Albert St? I would have thought it should be bus only like Wellesly Street will be. Maybe just make one end bus only so cars can still use it for access to buildings. If you pause at the end of the video you can see it looks like double bus lanes only on each side for the last block. Yes, lower Albert St between Quay and Customs St will be closed to all cars ie buses only. AT are also cutting cutting Quay St in half by the Ferry terminal, closing the through route to cars (buses excepted). This means the ramp from Quay St to lower Hobson St will become redundant, finally allowing Ludo Campbell Reid the opportunity to acheive his long held vision of demolishing it. AT sure has a strained relationship with trees. Am I right in believing that they won’t plant any new trees over services even though throughout our city, verges and street trees are commonly planted over services? The presence of the services is why AT don’t really like people planting fruit trees there. Seems to me a new blanket rule on the matter is going to put AT on a collision course with Goff’s Million Trees Project, or at least with Council intentions to plant street trees wherever possible. The tree is still there – it has a notice at the foot of it and someone keeps the planting nice around it. I spotted it on Google Streetview and hoped it was still there. Cool that it’s being looked after. ‘nightly watering’ haha nice euphemism! What’s wrong with raised median strips with trees planted in them? Without a median strip how can anyone possibly cross 4 lanes? Street trees offer more amenity to people when adjacent to or over footpaths, so pedestrians can enjoy their shade and beauty. Median plantings are a kind of motorway thinking. Gardening for the benefit of people sealed in their cars. Better than no trees, but certainly a lesser quality. But there must be a conflict between tree and verandas – as a pedestrian I would prefer the verandas. In the middle of the roads the trees can have nice big canopies. I agree. Verandas over footpaths and street trees on the median are the best combination for pedestrian amenity. No they can’t; they’re trimmed by vehicles constantly, unless the median is several metres wide. And there is no reason for trees and verandas to conflict unless the carriageway is so wide that trees are rammed up against buildings. Again the problem is the number of traffic lanes. Five is simply too many. Misallocation of space. AT is too engineering focused and only focused on vehicle traffic flow. Therefore the design should never be carried out by AT. We got many bad examples such as the new Manukau Interchange that is ruined by AT. How is the CBD doing at meeting Jan Gehl’s suggestion of halving the amount of asphalt? I didn’t realise how silly moving the bluestone wall was until I saw the video. Looks like you can look out at it from parking buildings, or from a car. Meanwhile we keep the “heritage” Auckland look, by importing kerbstones from China. Shipping rock … and pretending we’re taking action on climate change! Does Aotea station really need natural light? Surely the space the skylights occupy is much better utilised having a wide median stip with a row of trees. (In conjunction with removing at least one other lane of traffic).